Daniel: "I'm feeling kind of sick today. I think I caught Vivian's cold." Me: "Oh, I'm so glad to hear that!" He was a little confused at my response, until I explained why I made such a un-supportive comment. You see, earlier that day I had just received a new item for review- the SymptomPak cold and flu pack. Educational dosing chart to show you the exact medication(s) to take for your specific symptoms. Portable pill box with a mini-chart so you can easily take the correct relief with you. The easiest way to follow your doctor recommendations if you have high blood pressure, arthritis, diabetes and for pregnant women. I love this product and am so glad to have it. For past colds and flus, I've spent much time standing in the cold and flu section of the store, trying to match up bottles and boxes of pills with the exact symptoms that I have. I don't like to take extra medication for things that I don't have, but that often seems to happen. No more, now that I have SymptomPAK! 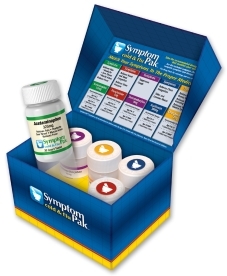 SymptomPAK is a box with five 30-count pill bottles, covering the five types of medication that are most often needed for colds, cough, fever and flu. But, since each medication comes in a separate bottle, so you aren't taking medication that you don't need. SymptomPAK is easy to use too. It comes with a handy symptom matching chart. Just pick out your cold or flu symptoms, look at the recommended medication for that symptom and dose as appropriate! For Daniel's cold, he was suffering from a cough and a headache, so we looked at the chart and found the combination of ingredients that dealt with those two symptoms. He took the two recommended pills and that was that! I also really like that this SymptomPAK is going to save valuable space for me in my small medicine cabinet, since it replaces almost all of the cold/flu medications that I usually buy! And everything is neatly stored in the SymptomPAK box, which also helps keep my medicine cabinet neat and organized. All the cold/flu medications that I found in the depths of my medicine cabinet. SymptomPAK covers all of the ingredients in all of these. SymptomPAK- neat and organized and all in one easy-to-store box! This great product can be purchased on a number of internet sites including Amazon.com, Drugstore.com, Target.com, Riteaid.com and HealthWarehouse.com. In addition to the big pack that contains the 5 bottles of pills, you can also purchase separate refill bottles if you use up one medication faster than the others. Disclosure: This post was written for Family Review Network & SymptomPak who provided the complimentary product for review in exchange for my honest review. I was not compensated in any other way and all opinions posted here are mine and mine alone.